Come see the magnificent Woolworth Building, a US National Historic Landmark, on this informative guided tour. This world-famous space was granted New York City Landmark status in 1983 but has been long closed to the public. 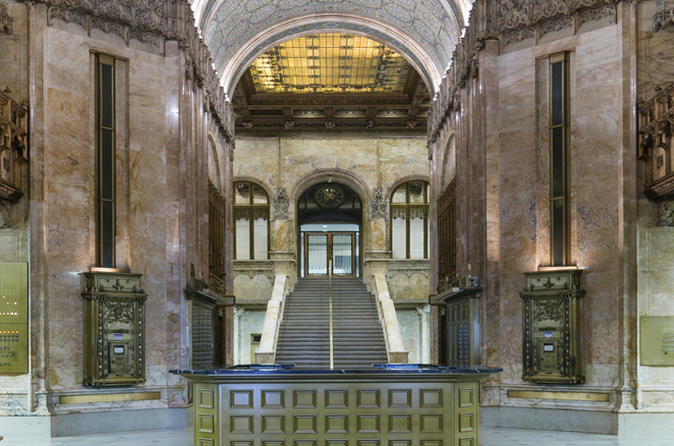 Explore the lobby, designed by the renowned architect Cass Gilbert, and marvel at the grand entrance to what was the tallest building in the world for 17 years. Dubbed “the Cathedral of Commerce," this historic landmark is unrivaled by any other on the North American continent for its scale, craftsmanship, beauty and sense of humor. The Woolworth Building, designed by architect Cass Gilbert, was the tallest in the world from 1913 to 1930. President Woodrow Wilson flipped a switch in the White House to turn on the building’s lights on its opening night 101 years ago. Hailed by architectural critics as an engineering marvel, it became instantly famous world-wide and helped to promote Frank Woolworth’s chain of 5 and 10 cent stores. Its extraordinary lobby is like no other space in North America, showcasing its grand proportions with splendid stained glass, spectacular mosaics, gorgeous murals and amusing sculptural details. In 1916, the Reverend S. Parkes Cadman called the Woolworth Building the “Cathedral of Commerce” as part of an effort to promote it as an ethical white-collar workplace. During the vibrant economy of the 1920s, the skyscraper’s Gothic design was viewed at home and abroad as a symbol of American material success. To this day, it evokes the expansive mood of the early 20th century, when New York served as the nation’s most prosperous port and gateway for the commerce of the world. Choose a 30-minute, 1-hour or 1.5-hour tour depending on how extensively you want to experience this famous historic landmark. See the Woolworth Building’s magnificent lobby, the more important elements of the building including the unique terracotta exterior, and the interior details such as the corbels with likenesses of the building’s owner, Frank W. Woolworth and Cass Gilbert, the architect, among others. This tour includes all areas of the main lobby, and provides a brief discussion of some of the more important elements of the building. There will be time for you to ask questions and photographs are allowed but no flash or videos are permitted. Special Offer - Book and travel by April 15th and save 15% off our previously offered price! - Book Now!